Quiet, feather light and perfectly balanced, the InfraShine UL2 Cool Switch Ceramic Blow Dryer is the technological breakthrough that the industry has been waiting for. Using our exclusive negative ion technology, the UL2 Cool Switch Ceramic Blow Dryer seals in moisture to create shinier, more manageable hair. All InfraShine dryers also feature a ceramic-infused grille that emits FAR-infrared-ray radiant heat that dries hair faster and cuts styling time. These design improvements, from reduced dryer weight to faster drying time, all work together to minimize the risk of carpel tunnel syndrome and give you more creative freedom and flexibility. The UL2 Dryer comes with custom designed nozzle and diffuser. This is definitely my "go to" hair dryer. It never fails to dry my hair quickly, leaving it shiny and full of body. I have recommended the UL2 to all of my family and friends. I love how luxurious my thick hair feels- especially after using the cool shot. The most important feature to me is how light the UL2 is. This is a life saver for my right wrist! Southern California (USA) – ICA, Inc of Southern California is pleased to announce the launch of UL2 Cool Switch Ceramic Blow Dryer – The latest addition to the InfraShine ClassicLine of styling tools. Quiet, feather light and perfectly balanced, the InfraShine UL2 Cool Switch Ceramic Blow Dryer is the technological breakthrough that the industry has been waiting for. Designed for professionals who demand the very best performance and quality, this is the most advanced ceramic blow dryer in the world. Only InfraShine uses authentic PTFC infrared heating technology, originally developed by the aerospace industry, which heats the hair from within to lock in its natural moisture, creating extraordinarily silky texture and shine. This revolutionary technology produces 2200 watts of drying power using only 1600 watts of electricity. The gentle but highly efficient heat source, coupled with an advanced DC motor, dries hair faster using less wattage, amps or electrical current than traditional dryers. In addition to emitting fewer EMF (Electric & Magnetic Field) waves, the lightweight quiet tone DC motor is also more efficient and lasts longer than traditional AC models. Multi level air and heat settings on the InfraShine UL2 Cool Switch Ceramic Blow Dryer provide high, medium or low amounts of heat and high or low airflow with a cool shot button to lock in style and shine. This convenient feature allows the user to alternate temperatures to speed drying with maximum comfort. The barrel of the dryer is also double insulated to allow for hand held styling techniques and the unique UltraGrip textured coating makes the dryer easy to grasp and hold. Although detachable, both the airflow concentrator and custom diffuser snap securely in place and stay put while in use. The air intake grille is also removable and is easy to clean and reattach, locking firmly in place. Keep hair healthy and shiny with the InfraShine UL2 Cool Switch Ceramic Blow Dryer with FAR-Infrared Technology. Available in salons and professional beauty supply stores throughout the United States. I give the InfraShine UL2 Ceramic Blow Dryer my highest recommendation! Ask your salon or local beauty supply about InfraShine. You can also visit their website for more information an where to purchase their amazing products! 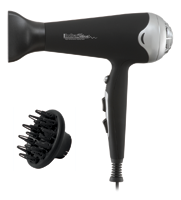 I am thrilled to be able to give one of these amazing hair dryers away to one reader! Open to US residents. Contest ends Friday, 11/13 at midnight, EST. I would love to try the AeroPlus flat iron! Well, I don't use a flatiron and I'd look silly bringing my own shears to the stylists (teehee), so I guess the redline pro blow dryer! The spring iron looks like a great curling iron! I found this giveaway by checking out the feeds in my google reader today! Eeek! I NEED a new dryer, and this one sounds divine! Their red line flat iron also sounds superb! This dryer sounds awesome. I'd love to try the spring iron. I'm diggin' their classicLine flat iron in pink! GO pink! I now subscribe to your feed, too! The redline pro blow dryer! I would love the Redline Flat Iron. I would love the flat iron! I'd like to have the Aero Plus flat iron. I would like to have the RedLine flat iron for my daughter! I would also love to try the InfraShine RedLine flat iron. I've been doing some touch up hair cuts at home lately and I'd love to have the R/50 razor shear to give me a more pro feel! Thanks! i also want the revolve shears, its been forever since i owned a good pair of cutting shears and my son is about to have hair long enough to trim soon! The AeroPlus styling iron - now that would be cool to have! I like the Redline Flat Iron. i'd also like to try the RedLine flat iron. I would like to own the Original flat iron. The iron I currently use has worn out and no longer styles my hair as well as it once did. I'd love the redline pro blow dryer. found this contest on Twitter. I found this either through Prizey or a link on another site. Cannot remember - sorry! I'd love to try the Red Line Flat Iron. Thanks! I found you through Prizey.net. Thanks again! I'd also like the InfraShine RedLine flat iron. I found this giveaway when I saw a tweet about it yesterday and followed the link to your blog. I would love to try the Redline flat iron or the AeroPlus. They look great! I'm now following you on Twitter.. and I RT'd your message. I'd love the medium ClassicLine flatiron in PINK! I'd also like to try their The Original Flat Iron! I found this giveaway from reading your blog in my email!